I know it’s hard to believe, but I only took a few pictures on Day 2. That was the day that we drove from Grand Junction to Steamboat Springs. The scenery was nice, but relatively uneventful. When we arrived in town, we picked up our keys to the timeshare, had some very tasty early dinner at Rex’s American Bar & Grill (recommended by the desk clerk when we checked in), then went grocery shopping so we were stocked up for the week. We got back to the unit, unpacked and settled in. That’s one thing really nice about being in a condo with a full kitchen. You don’t have to eat out every night and you can save a lot of money. We have owned our timeshare since 1984 and it has been a lifesaver in more than one lean year when we barely had enough extra money to get to and from the location. We could find lots of free things to do and still enjoy a fun and relaxing week without a big expense. When we stay somewhere for a full week, we usually buy enough for 3-4 dinners, all of our breakfasts and some extra snacks & lunch foods to get us thru the week. We always have plenty of food and usually end up going out a few times so it works out well. When the kids were younger and came with us we used to let each of them pick out a meal and do the cooking too. That way Mom had a little vacation from the kitchen. The kids also got to pick out their favorite “sugar” cereal since they weren’t allowed to have it when we were at home. Part of the fun of vacation is having great food and special treats! 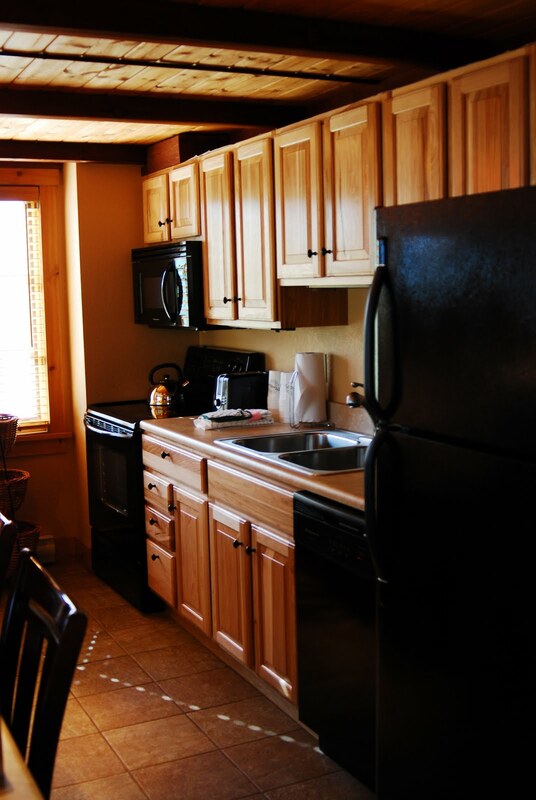 Here are a few pics of the condo. 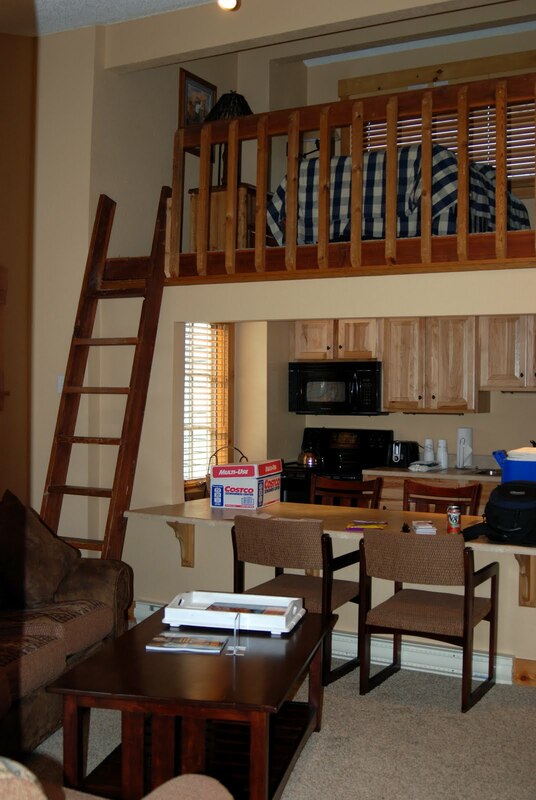 It’s a two bedroom with a loft that sleeps at least 8 people. It’s been recently remodeled and is quite comfortable. 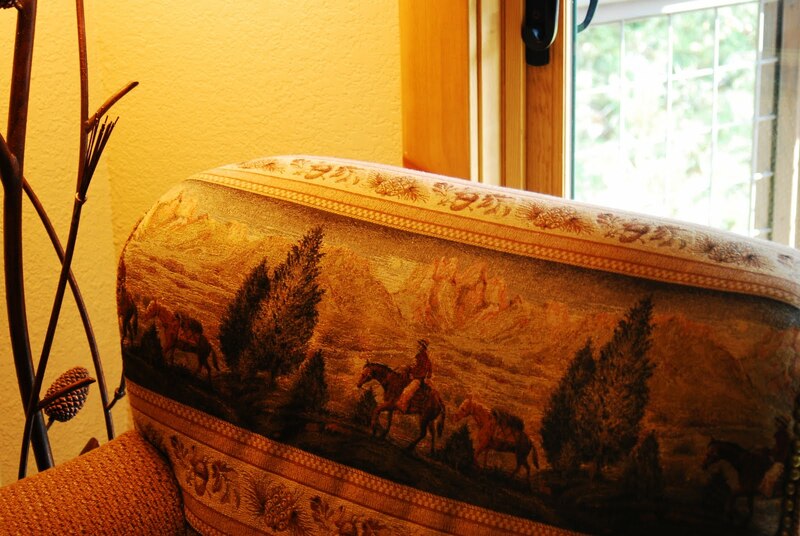 I love this western tapestry design on the back of the chairs. Click to enlarge to see the horses. 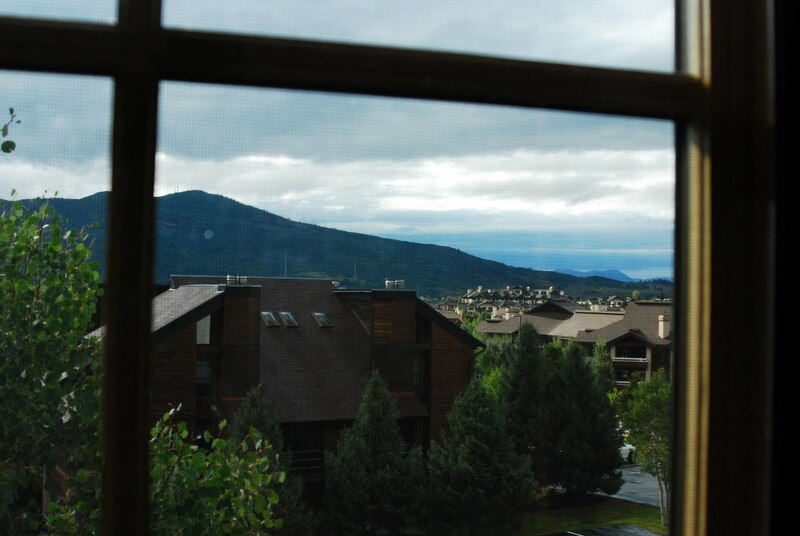 Here are the views from our balcony and the view from our bedroom window. Nice, huh? It’s been fun to watch the storms roll in in the afternoon hours. 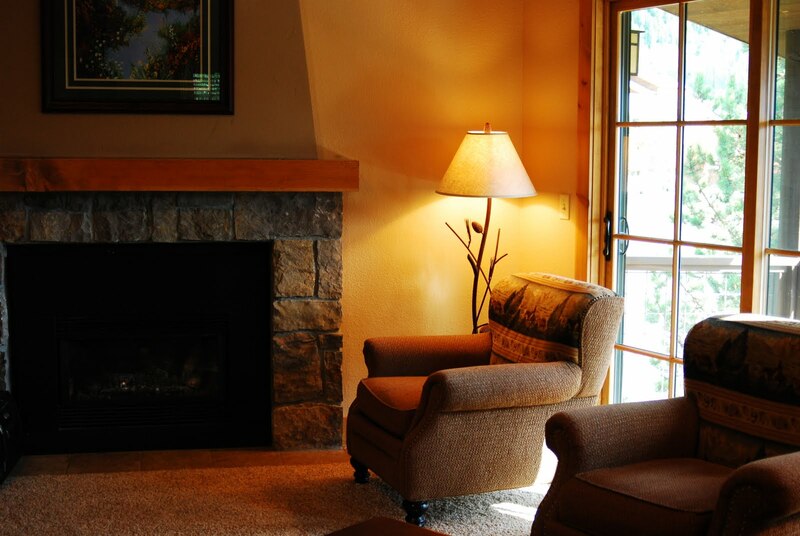 We’re very comfortable here and close to everything in town. 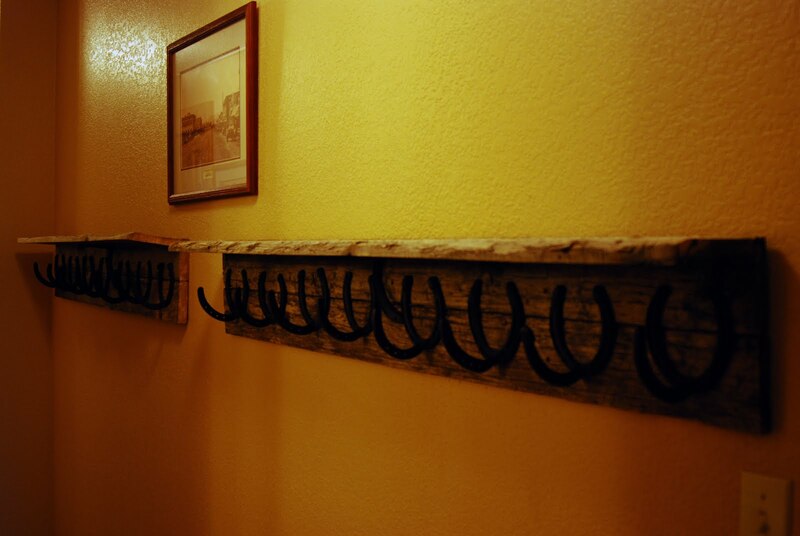 Check out this sweet horseshoe coat rack that hangs in the hallway. I’m sure it comes in very handy, especially in the winter when there’s ski gear and coats all over the place. So on Saturday night we just settled in and relaxed, got a good night’s sleep and prepared for our visitors. Actually Terry took a nice long walk in the morning. He was gone almost 2 hours! I was just about to call him and see if he was lost when he walked in the door. When I asked if he had gotten lost he said, “Well, I wasn’t lost but it took me a while to figure out how to get back here.” (Should we run thru the definition of lost?) He’s so cute. I stayed in my pajamas working on my photos and blogging until 3 in the afternoon. NICE! Then I finally got dressed because our dear friends, Randy & Linda were closing in on their arrival. It was so awesome to have them join us. We haven’t had a chance to vacation together in a long time and we love their friendship and their company. We love to laugh and cry and just share life together. 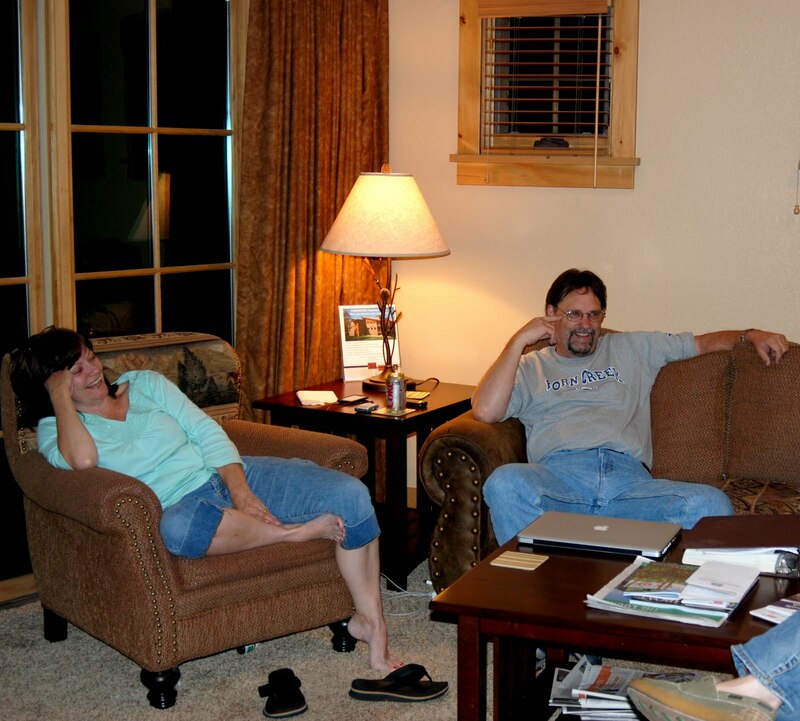 What a blessing to have friends like that who we’ve known for over 30 years. Thanks God. Once they were here, we heard about their trip and let them get settled in. Then a few hours later, our son Kevin arrived (around 10:30 pm). He had driven over 10 hours from Omaha and we were very excited to see him for the first time since last summer. He was stationed in Afghanistan with the Air Force for a while since we last saw him, so it was great to get a chance to give him a big hug and to catch up a little on his life. He is now officially finished with active military duty and is in pursuit of his next adventure. He’s waiting for a job interview which sounds very promising. 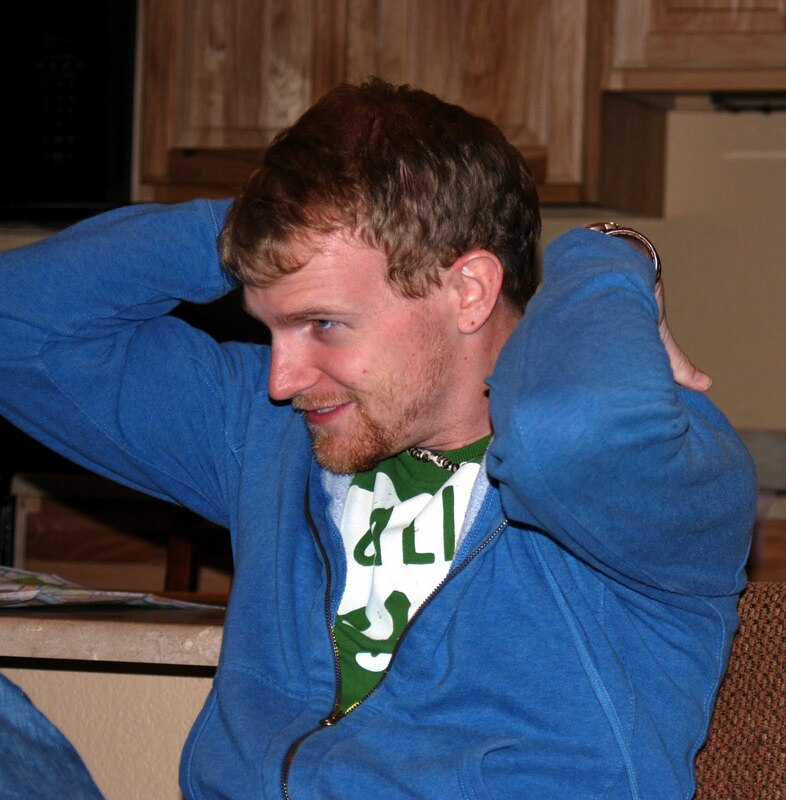 We were thrilled that he was able to come over to join us this week because we expect that he may be living somewhere besides Phoenix and our visits with our kids are always so precious to us. 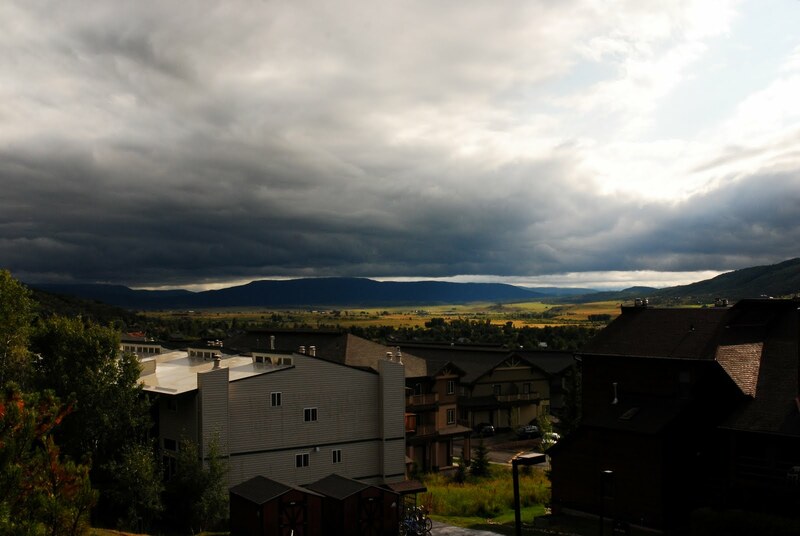 We've just been eyeing Colorado…and Steamboat Springs in particular…maybe for next year. 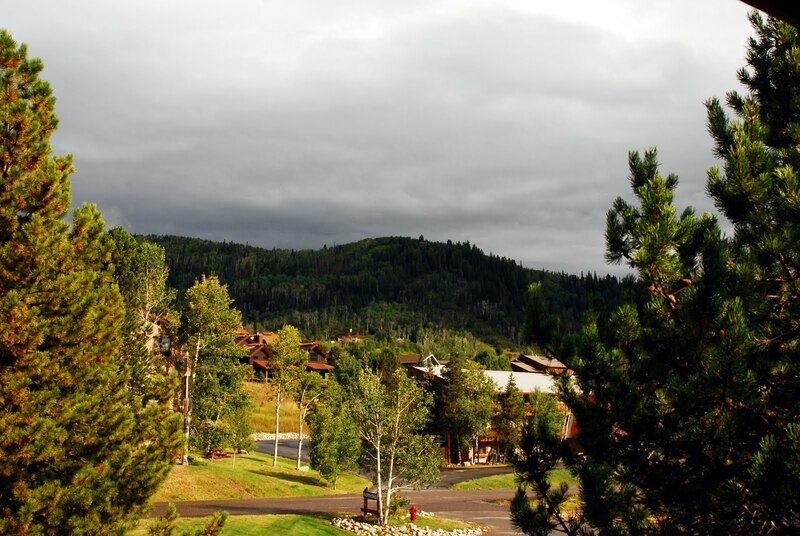 We also own a timeshare…that happens to have a resort in Steamboat Springs…definitely a drawing card. Looks like a great spot to visit!